A health worker sprays disinfectant around the area where a suspected Ebola patient sits before loading him into an ambulance in Freetown, Sierra Leone, on Wednesday. This week, the U.S. Centers for Disease Control and Prevention issued an alarming Ebola forecast: Without an increase in effective interventions, there could be 1.4 million cases of the disease in Africa within four months, up from the fewer than 7,000 cases recorded so far. But behind the report are many assumptions and limitations that reduce its accuracy. And we may never know the true accuracy of the forecast. Donor nations and groups may ramp up their fight against Ebola because of that forecast, undermining its central assumption that the status quo continues. The CDC paper, published in the agency’s Morbidity and Mortality Weekly Report, listed five limitations, including the risk that extrapolating growth trends past three months proves inaccurate. One of the potential limitations is that the CDC is assuming that most cases are going unreported. It is forecasting that for every reported case, there are 1.5 others not in the official records. That’s based entirely on one comparison, between the number of beds the CDC model expects would be used in Liberia for Ebola patients and the number that are, according to those operating treatment units — about two-and-a-half times as many. “Due to the difficulty in collecting relevant data from the field, at the time of writing, we only had one data point (datum, really) related to the difference between calculated beds needed and actual beds in use,” CDC lead author Martin I. Meltzer, a researcher at the agency’s National Center for Emerging and Zoonotic Infectious Diseases, said in an email. There are plenty of reasons to believe the reported number of Ebola cases is an undercount, such as this New York Times report highlighting a discrepancy between the number of reported deaths in Sierra Leone’s capital of Freetown — just 10 — and the 110 victims of the disease buried in just one Freetown cemetery over a recent eight-day period. Nonetheless, relying too much on Liberia might increase the uncertainty in the CDC’s projections. Reported cases have been increasing much more quickly there than in Sierra Leone and Guinea, the other two countries with more than 1,000 cases. Several updates in August showed a rate of increase in Liberia that would have corresponded to a doubling of cases in fewer than 10 days, much faster than the overall rate of doubling every 20 to 30 days. 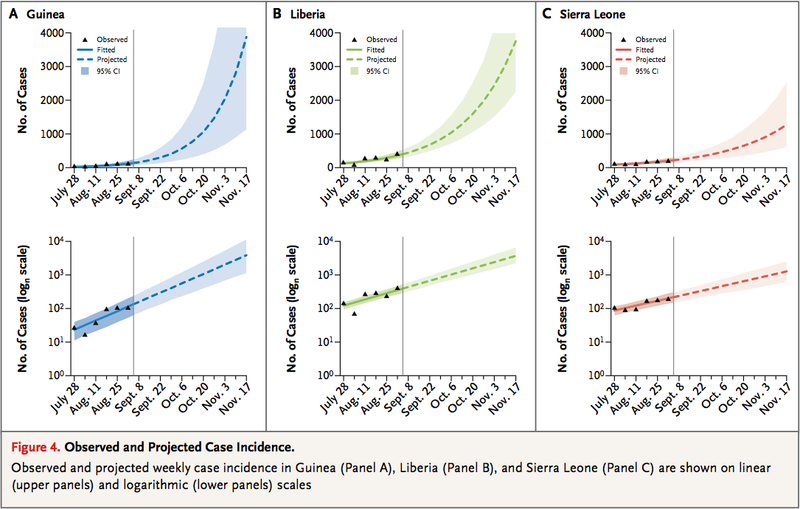 A World Health Organization report this week highlighted the United Nations body’s recent effort to improve data on the Ebola outbreak, citing that Liberia data was “being reported from 4 different and uncoordinated streams, resulting in several overlaps and duplicated numbers.” Unlike the CDC’s paper, the WHO’s scientific-journal article — in the New England Journal of Medicine — showed calculated uncertainty. The WHO expected overall cases to top 20,000 by Nov. 2, not counting suspected and undetected cases. But the agency also showed that while case counts of about 4,000 each in Guinea and Liberia were the most likely scenarios Nov. 17, counts of about 1,000 and 2,000, respectively, were within the realm of reasonable possibility. Interventions by the WHO, the CDC, the U.S. military or other bodies could all make the lower end of the forecasts more likely. “Left unchecked I wouldn’t be surprised if CDC’s pessimistic outlook was realized, but with improved international efforts, possibly linked to new preventions like vaccines, then these numbers probably won’t pan out,” Jonathan Ball, professor of molecular virology at the University of Nottingham in the U.K., said in an email. Neuman said that even without outside intervention, affected societies eventually would reorder themselves to better fight Ebola. He also doubts that people not yet affected are just as likely as those who have been to get infected. “To some extent, I think money is going to protect some people,” he said.